Fruit Juice therapy or simply called juice therapy is the treatment of diseases, wherein you consume juices of fruits and vegetables. Here you have to follow a special diet, in which fresh fruits and raw vegetables are included. The juice of these fruits and vegetables are taken and consumed. Juice therapy is also known as juice fasting. Juice therapy is an excellent way to restore your health and for removing all toxins from your body. This way your body will be detoxified and rejuvenated. This is also very beneficial for increasing your immune system and helps you to get a glowing skin and healthy body. Juicing or Juice therapy got popular during the early 90s, when it was recommended for slowing down the process of aging and the occurrence of cancer. Juices are very delicious and you can hardly find anyone not liking it. They are natural and very safe for your body. They do not cause you any harm and are also not very costly as the health tonics those you get in the market. . Most of you can afford fruits and vegetables. If you consume the juices with herbs, homoeopathy or other therapies, it is better for your health. You can make fresh juices out of fruits like apple, orange, guava, grapes, cucumber, mango, pumpkin, wheat grass, etc. fruits in this juice therapy process. Juice therapy provides you organic minerals, which the body can assimilate easily. Some of these minerals are calcium, silicon and potassium, which help in keeping a balance of the biochemical elements in the cells and the tissues. This in turn keeps your skin protected from premature aging. If your body is suffering from any sort of infections, fresh juice therapy is an excellent remedy. It makes the healing of infections fast. If you are having hair loss problems then you can follow juice therapy to control such problems. 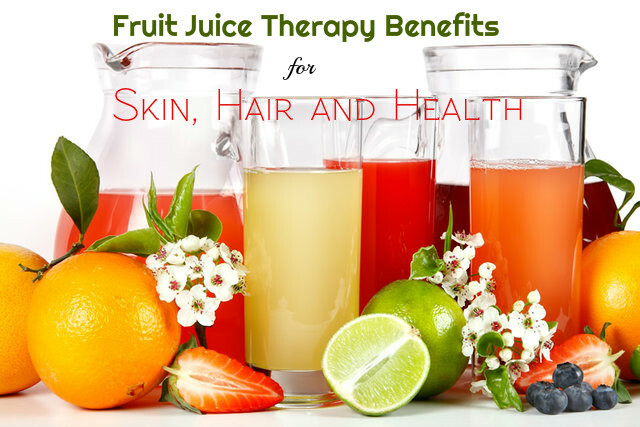 Many fruit juices increases blood circulation in the scalp by working as a natural stimulant on hair roots. Some of the fruits and vegetables that you use for juice therapy contain insulin. Pancreas needs it for manufacturing insulin in the body. Insulin is essential for maintaining normal levels of sugar in the blood. Cucumber, onion, radish garlic and tomatoes used in juice therapy are rich in antibiotics. If the juice is very sweet, you can add water and dilute it. Patients suffering from diabetes, arthritis, hypoglycemia and high blood pressure benefit a lot from it. By following a special diet of raw fruits and vegetables you can recover faster from various diseases. Fruit and vegetable juices are much more useful for your body than pure water fasting to cleanse and regenerate the tissues. Fasting is an excellent way to burn the wastes that have accumulated in your body and to excrete them. If you drink alkaline juices instead of water when you fast, the cleansing of your body is made more effective. This helps in increasing the healing benefit of fasting and speeds up the removal of uric acid and other inorganic acids from the body. Adding sugar to the fruit juices makes them even more delicious and tasty. This makes your heart strong and helps in curing a number of diseases associated with the cardiovascular system. Raw juice therapy helps in eliminating toxins from the body and cleansing the organs. Raw fruit juices are excellent for detoxifying your kidneys, liver, lungs and the skin. They flush pout the metabolic wastes and toxins that have accumulated in your body and sooth your digestive and assimilative organs. Raw fruits therapy is excellent for increasing the digestion of the food and allows the body to utilize the nutrients present in the food you eat. The juice that you take from fruits and vegetables has great medicinal properties. So juice therapy is excellent for your health. It helps in revitalizing your body and enhances the functioning of your body organs, and rejuvenates your body parts. The juices that you take from fruits, plants and vegetables are rich in minerals, vitamins, trace elements, natural sugars and enzymes. They maintain the normal functioning of your body organs and provide elements needed for the healing process and regeneration of the cells. Keep the fruits and vegetables in water for 10 minutes, after adding vinegar or tamarind water to remove insecticides and pesticides sprayed on them, and then take them out and wash well under running water. This will remove all chemicals deposited on them. Scrub well as you wash them. This way all dirt is also removed. If you feel that they have been waxed, then remove the skin of the fruits and vegetables and then use them. If there are seeds, remove them. Citrus fruits are to be peeled. Cut the vegetables and fruits in to small pieces. This way you can grind them without any difficulty and you also get a fine pulp after grinding them. Grind and spin them and then extract the juice from the pulp. Some fruits like bananas and avocados do not contain much water and therefore it is difficult to get the juice from them. So you can process them using a blender. You must not use imported fruits and vegetables because they contain high amounts of pesticides. Once you make the juice, you have to serve it immediately. This will provide you the best results. If you keep juices in the refrigerator, they may lose their nutrition and so they are not very beneficial for your body. So make only what you need and do not store it. Moreover, raw juices get oxidized fast. If you feel that the juice you have made is very sweet, you can dilute it with water or mix fruit juices that are not very sweet. So, if you have never tried juice therapy in your life, it is time that you try it. See how you become healthy and your skin glows after this awesome therapy. How to Lose Weight in 30 Days Fast at Home Naturally?